If I had to choose one surface fly to use on loch or river for wild trout at any time of the year this would be it. It can be used (in different sizes and colours) to imitate small midges, hatching insects of all species, daddy long legs, a drifting caddis fly, terrestrial leggy creatures from cowdung flies to heather moths, it makes a good natural strike indicator and just for good measure a super bobfly (with something black on the point)or even a mini surface lure. No doubt you will find other niches for it to fill on your own waters! 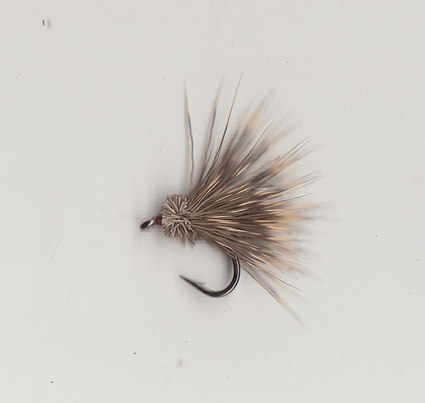 The fly can be fished as it is but if it is used as a Daddy imitation work the deer fibres with thumb and forefinger to splay the legs out, lots of prick points for the fish to spot in the surface film. To Gink or not to Gink. Leave unteated and the fly will still float, but it will start to sit in the film and eventually sink (especialy after a few fish). The fish might well prefer it at any of these points so let them decide. However if you want to use it as Caddis imitating dryfly or as a strike indicator it would be wise to gink the fly. Tactic 1. Fish are rising to small midges near weeds in a light ripple: fish a single fly and cast around the weed edges, lift the rod top slightly to animate the fly and get the fish to notice it. Tactic 2. Fish are again rising but will not take the Deer Spider on the surface. Put it on the dropper and use a buzzer or small Black Spider on the point. Gink the Deer Spider and watch it for takes. The size of Deer Spider is dictated by the strength of the wind and the size of point fly. Tactic 3. On a windswept loch on a warm day, the fish might not be rising but you might well bring some up with the following tactic. Use a 15ft leader with 3 to 4 feet between the point fly and dropper. Use two Deer spiders and cast across wind, retrieve line to keep in touch with the flies, not to move them however. The line eventually drifts into the side, take a pace and re cast. This is an excellant way of finding feeding fish on a large loch. If you want to animate the flies just lift the rod top slightly. Tactic 4. On a fast river during the day both brown and sea trout will take the Deer Spider fished dead drift in the fastest water you can find. Fast water holds lots of oxygen and the fish love this but will always keep an eye open for anything drifting down. Tactic 5. 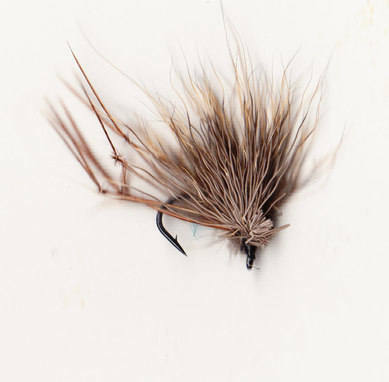 Again on that fast stream, as the light goes try a large Deer Spider cast across and downstream, aim for the fly to wake.The V on the water will bring up big fish. A similar trick can be used on stillwater, cast out and strip back or cast a short line down the bank and use the rod (10 to 11 feet) to work the fly. Put the Deer Spider on the point and use Buzzers or CDC Emergers on the droppers, cast out, retrieve line to keep in touch with the flies and watch the Deer Spider for takes. This is a good tactic to use when fish are rising on the move, fish thewater rather than cast to individual rises. Tactic 6. On loch or river when the fish are not rising try this. Use a Deer Spider on the dropper and a LeadedGold Ribbed Hare's Ear on the point. Cast into likely water, do not forget to fish the shallow water on loch or river good fish are often found in the edge. Use the rod tip to animate the flies, takes to the point are shown when the Deer Spider skates off across the surface. Takes to the Deer Spider migh indicate that the fish are starting to anticipate a hatch. 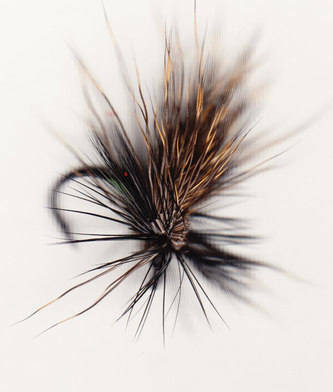 Replace the point fly with a Black Spider and you have a good searching wetfly cast, especially on a windy day or fast water this team can be fished quickly, use them as mini lures to get the fish to respond. Use 4 to 6lb nylon when fishing like this, a fast moving fly means the fish has to move quickly to catch it and there can be quite a bang! The strength of the tapered leader is dictated by the tippet. Use a 6to 7lb Leader for a 4/5lb tippet. Eventually you will nibble back on the tapered leader, extend it's life by tying a mid section to it, and then the tippet. Find out more ways to fish the Deer Spider, let me know!